Quite the unexpected surprise from comedienne Tina Fey! 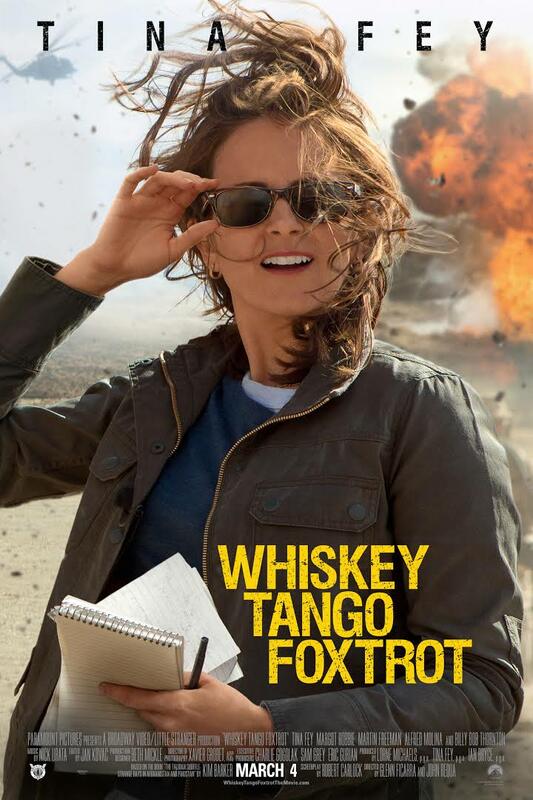 Paramount Pictures’ Whiskey Tango Foxtrot is one part self-reflexive film on television news production and one part self-discovery. Unlike the feel of the previews, WTF is not really a comedy–not in the traditional sense anyway. There certainly are moments throughout the film that are funny and will cause you to chuckle, but it is definitely more of a drama. The brilliance of Fey’s acting in this movie is truly showcased by her ability to display that she can do serious just as well as funny. Most of the funny parts are given away in the previews, so don’t think you’re going to get more laughs during the movie. Based on actual events, WTF takes you behind the camera and behind enemy lines to depict what it is like for television news foreign correspondents in a war zone. Although the movie was not what I expected at all, I am very pleased with the story, all be it, slow burning. Beyond the self-reflexive subplot in the movie is the foreground story of self-discovery. Fey represents so many of us who just feel like we are spinning our wheels, treading water, or even moving backwards. The inspirational elements of the movie come from her willingness to take chances, make mistakes, and get dirty (as the Magic School Bus‘s Miss Frizzle would say). What would you do? You’re dissatisfied with your job as a television news writer/producer, have a mildly depressive boyfriend, small apartment, and just need to get away. If you’re Kim Barker (Tina Fey), then you head off to Kabul, Afghanistan to become a foreign correspondent during the early days of the War on Terror. After an expedited visa and passport, Barker embarks on her journey as a representative of the U.S. press in one of the most dangerous places on earth. Armed with her laptop, camera, notepad, and two staff members, she sets out to discover the real stories in Kabul and the surrounding areas. Thinking that she is the only girl in a military barracks, Barker is relieved to meet Tanya Vanderpoel (Margot Robbie) who takes Barker under her wings to show her the ropes of reporting the news amidst a war and hundreds of “thirsty” journalists and military personnel. While covering the stories of the war, Barker concurrently takes a journey of self-discovery that is filled with mountains and valleys. Let’s be real here. Even if you analyze movies on a regular basis like me, you too were probably thinking that this would be a dramedy (drama/comedy). And yes, comedy is really drama in disguise; but I digress. The previews are certainly cut together in such a way that it looks like a very Fey-esque wartime comedy. I am not going so far as to saying that Paramount pulled a bait ‘n switch–because the movie is of a good quality and enjoyable–but the is no doubt that I went in expecting classic Fey and was presented with her more serious side. Still, through her witty quips and non-verbal dialog, she infuses conventional comedy and self-deprecating humor throughout the narrative. Like many dialog-driven dramas, even ones during a war, this movie has a very slow pace especially in the first act. Some additional comedy probably would have helped in the beginning to hook the audience. Speaking of the hook, that is probably what’s missing from the first few minutes of the movie. I think the studio sacrificed a traditional hook because the hook was Tina Fey herself. Fortunately, the film wastes no times in getting Kim Barker to Afghanistan, and that is definitely a good move. Although we are introduced to several chief characters in the movie, the focus is definitely on the character development of Barker with some minor development and introspect on the other principle players. There are really two stories here: the foreground story of self-discovery and the background self-reflexive plot. Both are seamlessly married together in order to accurately tell both without sacrificing the other. Although we all know that there are foreign correspondents in war zones, we don’t always get to see what it’s really like to uncover stories, pitch to executives back in the states, and maintain sanity and safety; but through this film, we witness just how hard it really is to be a foreign television news correspondent. From networking, to interviewing, to shooting B-roll and stand-ups, Barker takes us on the journey from concept to delivery of producing news int he middle of a battle zone. Beyond the battle field, Barker is coping with her own personal and professional battles. If it isn’t the cheating boyfriend, it is the network who put her on the hourly plan and gives her no screen time. But, through it all, Barker never gives up and refuses to sit idly by and allow herself to be walked over. Fortunately, Barker does get her big break during the climax of the movie, but you’ll have to watch the movie to see what that is. If you plan to see just one movie this weekend, I definitely encourage you to see this one. It’s gritty, funny, and inspirational. This is also a great opportunity to watch Fey in a more serious role and decide for yourself if she convinces you that she can play serious just as well as the comedy we all know and love her for. You may have seen other wartime movie, but this one plays out differently in that the focus is truly on the character development of the protagonist with the war merely being the backdrop and conduit through which we see her story of summits and pitfalls. Good review. It was way too much of a mess for me. The cast tried, but they got sucked down.